Approx. 50 ml per tire. For large volume tires (width 57mm or more) increase the dose to 75 ml. 25 ml is sufficient for racing cycle tyres. Ensures effective puncture protection for around 3 months. Punctures are sealed automatically while riding. 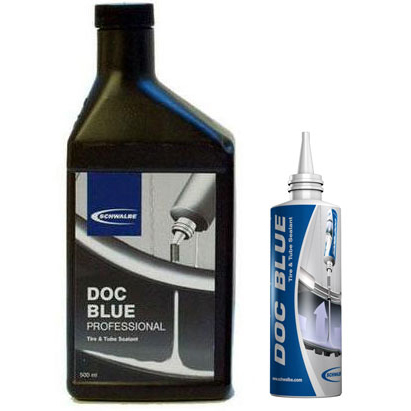 Doc Blue is not intended to seal large holes caused by cuts or bursts. Does the job nicely, in fact, this stuff is miraculous! This kit is great - contains the big 500ml bottle of sealant, plus a 60ml bottle to measure the 'dose' into the tyres and a good quality metal valve core removal tool - great kit, excellent value and Merlin fast service - what's not to like ?